April 3 marked the sixth anniversary of National Walk to Work Day. Former Secretary of Health and Human Services, Tommy G. Thompson, initiated the first National Walk to Work Day in 2004 to draw attention to the need for exercise and to encourage Americans to turn their commute into an exercise opportunity. 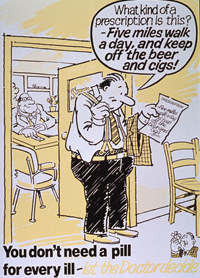 This poster, published in England, humorously reinforces the message that exercise improves health. The World Health Organization (WHO), headquartered in Geneva, Switzerland, is one of the original agencies of the United Nations. As a coordinating authority on international public health, WHO continues to battle disease, especially infectious diseases, and to promote the general health of the people of the world. This 1958 poster emphasizes the WHO’s key role in fostering good health worldwide. From the Prints and Photographs Collection, National Library of Medicine. April 1, 2009 in Collections.